This concert celebrated the 85th birthday of distinguished Canadian composer R. Murray Schafer. It also celebrated his more than 40-year association with the Vancouver Chamber Choir and conductor Jon Washburn. The group has now performed 27 of his works, including 12 commissions, and has made three CDs entirely devoted to his compositions. 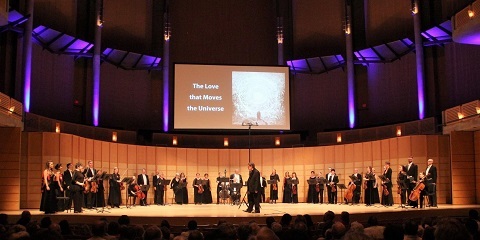 Two of the pieces performed on this occasion are relatively recent: ‘Narcissus and Echo’ (2009) and the bigger-scale ‘The Love that Moves the Universe’, written for the 2010 Vancouver Winter Olympics. While one can regard Schafer as a true pioneer of ‘soundscapes’ and various experimental techniques, it is his awareness of the beauty and sensuality in textures, his sense of dramatic balance and his commitment to exposing the ‘sonic pulse of the earth’ that speak most readily to the listener. Everything about this concert was refreshing, and the choir and orchestra were at their best. The documentary film and video of the composer’s ‘Sun’ shown in the first half only added to the radiance of the proceedings. Schafer has long lived in rural Ontario, yet one recalls his strong Vancouver roots. He was enlisted by Simon Fraser University to work on soundscape projects in the late 1960s, at the very start of the (then more experimental) institution. Everyone knew of his work locally: his iconoclastic perspective on sound and the environment; his idea that ‘sound is independent of its creator’; and his 1977 book, The Tuning of the World. Later on, an important idea was that humans could create too many sounds, to potentially negative effect. One likely never appreciated just how influential his ‘ecological soundscape’ focus would become. Schafer won the Glenn Gould Prize in 1987; most of his Juno awards came in the next decade. He received the distinguished honour of Companion of the Order of Canada in 2013. The composer’s works have been performed regularly throughout the world, and I was delighted to hear the Banff Competition-winning Rolston String Quartet’s performance of his early String Quartet No.2 (‘Waves’) last October. Its engulfing beauty and flow were absolutely distinctive. The children’s vignette ‘The Star Princess and the Waterlilies’ (1984), an early work with narrator that fuses a naturalistic motif with a lovely childlike sense of wonder, started things off with an appealing freshness. George Roberts did a fine job telling the story, while the choir consistently brought character to a relatively simple musical fabric. The choir begins with a striking glissando, yet while these effects and some quarter tone slides appear throughout the piece, it was the charm of the singers in bringing delight to the skipping rhythms of the children’s tunes, while artfully sustaining the many soft legato lines, that stood out. Fabiana Katz had a touching simplicity as the Star Princess. There was sensuality and beauty throughout, and it intrigued me how wide-ranging the expressive references were: some passages (those depicting the cacophony of animals at the beginning) possibly harked back to the ‘bleating sheep’ of Strauss’ Don Quixote, while the innocent purity later on suggested a feeling akin to Britten’s Saint Nicolas. The story of ‘Narcissus and Echo’ derives from Ovid: a young hunter obsessed by his own beauty falls to his death after seeing his image reflected in a pool of water. Tiresias is the blind prophet telling the story, splendidly conveyed through the clean, firm tones of Steven Belanger, assisted by Echo (Christina Cichos) and the choir. In exploring the ephemerality of beauty, the dramatic force of Tiresias often plays against an engaging lyricism from the choir. Offstage soloists, oscillating textures and antiphonal effects all come into play. The evolution of these musical textures was inspiring, as was the range of expression in Belanger’s narrative. The scene where Echo dissolves into nothing was special, a lovely fusion of timelessness and beauty, while the closing farewell to Narcissus – pianissimo with offstage soprano – secured a moving sense of resolution. The major work of the evening was ‘The Love that Moves the Universe’, using text from the first and last cantos of Dante’s ‘Paradiso’ in The Divine Comedy. There were many characteristic Schafer effects in orchestration – all the glissandi, insistent tremolos, slicing pizzicato that one recalls from his earliest days – but these were artfully integrated with a lyrical flow that highlighted waves of choral and instrumental sound. The work involved moments of soft deliberation as well as ones of unbridled, frenzied momentum, yet maintained superb cohesion, possibly due to the composer’s skill in imparting geometric symmetry to the structure (‘the geometry of the spheres’) and exploiting a role for circular form. To add emphasis to this design, the performers were set in a large semi-circle with each singer paired with an instrumentalist. There was both universality and physicality in the work’s unfolding but also a strong emotional resonance. In the closing Canto 33 one noticed the wonderfully ripe expression of the lower strings, building strongly and inexorably alongside the ‘love’ in the choir’s expression. This was quite an experience – almost a transcendent ‘romantic’ one – and the deep commitment of all performers was evident throughout. For all the sharper, more abstract aspects of Schafer’s writing, it was noteworthy just how accessible and directly communicative these pieces were. It was a magnificent birthday celebration for a composer who has sought innovative musical and literary expression for 60 years. Jon Washburn also contributed an illuminating slant on the choir’s long association with Schafer, savouring a story about the premiere of ‘Sun’ in 1986. He expected the score to arrive in normal sheets of music; instead, it was a scroll that unwound to about 20 feet. To recreate the obvious surprise, Washburn and his assistants illustrated right in front of us what the unraveling of such a scroll looked like. Fine videos of both this work and the recent National Film Board interview in the composer’s home were also aired.